Struggling to catch up to the hype for the final season of Game of Thrones? Find out below on how you can catch up to your favorite medieval fantasy series! We have to warn you now, this is not your typical medieval series. With all the flying dragons and zombies involved, it will surely leave you hanging and wanting more! Game of Thrones is an American fantasy drama television series created by David Benioff and D. B. Weiss for premium cable provider HBO. The story is based on a series of novels by George R.R. Martin called A Song of Ice and Fire, and is set in the fictional Seven Kingdoms of Westeros and the continent of Essos. The premise of the series revolves around the violent struggles among the kingdom’s noble families for the Iron Throne, a symbol of power and dominance, while others battle it out for to gain freedom away from the throne. 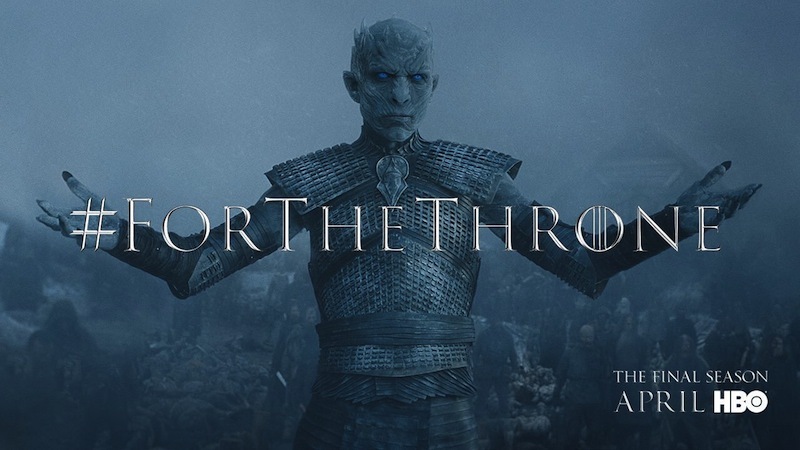 Meanwhile, an army of White Walkers–the zombies we mentioned–in the icy North threatens them all. Game of Thrones premiered on HBO on April 17, 2011. To date, it has aired 7 seasons at 67 episodes. The series is set to conclude with its 8th and final season which is set to premiere on April 14, 2019. You can watch episodes of Game of Thrones at 9/8 c on HBO. If you do not have a cable provider or HBO is not available in your area, we got you. Here are the ways – both unofficial and otherwise – you can catch up to the latest happenings in the Seven Kingdoms. 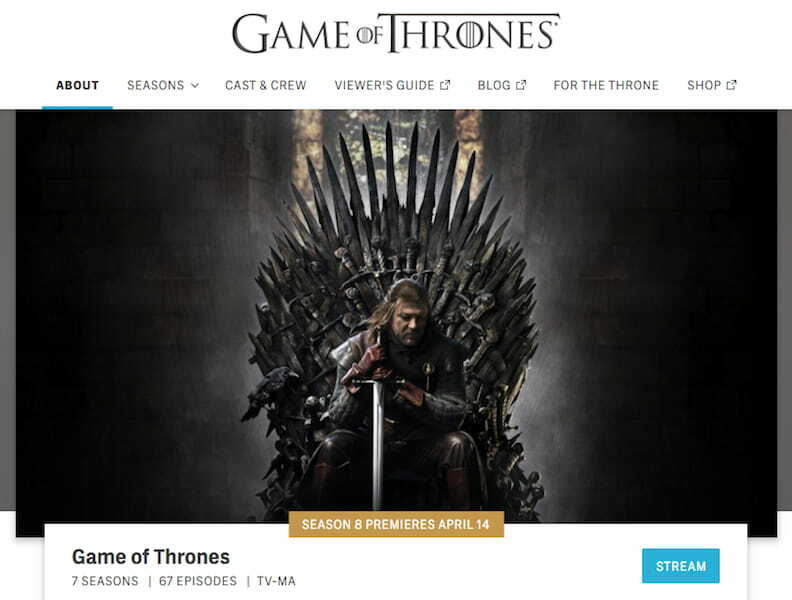 HBO has done a great job making the content for Game of Thrones available on its website, although the premier in 2017 was not so stellar since HBO websites kept crashing. HBO offers all 7 seasons of Game of Thrones on its premium streaming service, HBO Now–its official streaming platform–for U.S. residents and certain regions. All you need to do is sign up, subscribe, sit back and stream all your favorite episodes of Game of Thrones. There’s also a 7-day free trial in case you just want to try it out. Good luck with streaming all the seasons, though. Not a U.S. resident? Don’t worry. You can still watch it through HBO if you use a VPN (which we will cover down below – feel free to skip ahead). If you don’t have HBO (like most of us), Amazon is a sure alternative. Amazon’s partnership with HBO means all seven seasons of Game of Thrones are available on its site. 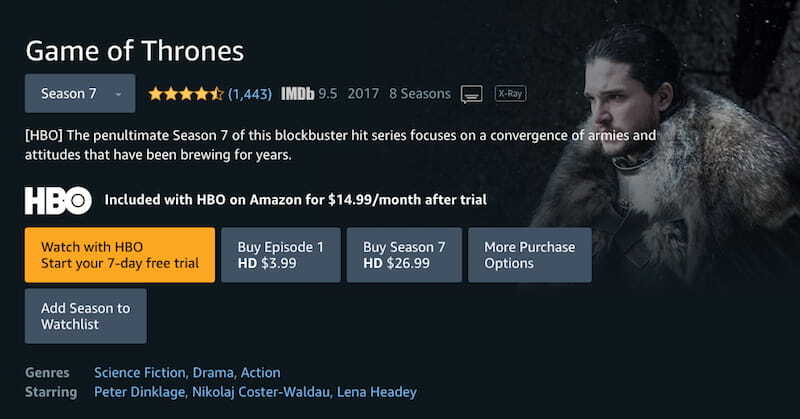 If you have an Amazon Prime subscription, you can choose between streaming the series on its website, or on HBO. Pretty sweet! Alternatively, you can also buy the episodes individually or bundled in HD or SD so you can watch it on your lunch break or on-the-go. One thing to remember is that if you choose to stream on HBO through your Amazon Prime subscription, the limited viewing for U.S. residents will still be a problem. That’s why we always encourage our users to use a VPN to bypass these restrictions. Scroll down below to find out how. Amazon Prime Pricing: $3.99/$2.99 (HD/SD) per episode; seasons 2, and 4-6 for $38.99 each; season 7 for $26.99. Note: The bundle for Seasons 1 and 3 is currently unavailable, but you can still buy the episodes of both seasons individually. If you are residing in the U.S and you have an Apple device but you do not have a subscription on any of the two services mentioned above, then you can stream the series on your Apple iTunes application. Fortunately, all seasons of Game of Thrones are available on the application, so all you have to do is access your iTunes app, buy the season you want to watch, then stream all the way. With the exception of season 7, all previous individual season bundles are priced the same so it’s a lot easier to weigh your options. For non-residents, just make an iTunes US account and you’re good to go. In case you didn’t know, it also lets you download the episodes individually. So, no problem binge-watching while you’re on the road. If you’re into something new and you want a change from other popular alternatives such as Amazon and iTunes, then it’s best that you learn about Vudu. It’s basically the same paid streaming service like those mentioned above. If that’s not convenient enough, then check this out – it also allows you to download the episodes on your computer or your smartphone for easy access on-the-go or for later viewing. It’s a reasonable price compared to the others, so if you want something new, go with this. If you don’t want to give up your hard-earned cash to subscribe to premium streaming services, worry not. We give you these unofficial ways to stream Game of Thrones online. YouTube’s (and Dailymotion at times) copyright infringement policies will frequently prevent people from uploading Game of Thrones or other series on its website. Do these websites have an agreement with HBO? Well, this site seems to be an alternative that can work. In case you haven’t heard, it is one of the most recommended sites for streaming services, often ranking first place on search engines for “watch series online for free” queries. You need to make an account to be able to start streaming on their ad-filled site. Another alternative which offers the same experience is Openloadfreetv.me. Like Moviecafe, it’s also one of the most recommended sites on the web for streaming services. But unlike Moviecafe, Openloadfreetv does not require you to make an account. Just key in Game of Thrones on the search bar, click on the episode you want to view, then you can sit back and relax to start streaming. The downside though is that since this is another unofficial site, expect to be (always) required to view an ad which is about 30 seconds to a minute long before you can start streaming. If neither method does the trick, then you can just go to Google. Just type “watch game of thrones online for free” or “stream game of thrones season free” to find what you’re looking for. However, since most of the links you will find always advertise themselves as legit, exposure of your computer to malware and virus will be your everyday problem. We recommend that you use this method as a last resort. Piracy is illegal and punishable under the law so we do not condone it. 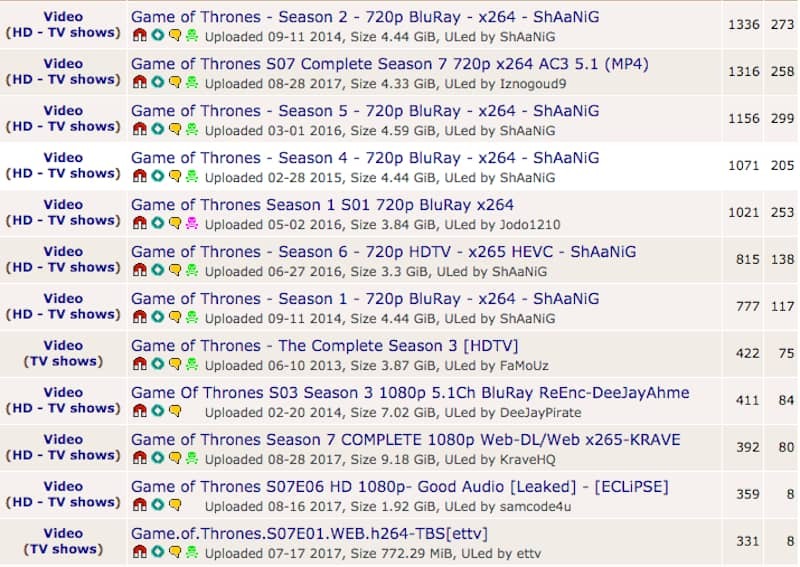 Game of Thrones is one of the most popular shows to air, and a huge torrent community behind it. Technically, you own the particular episodes you pay for and download on the platform you choose. But if you open it for the public to share, you risk exposing yourself to punishment and fines. Again, we do not condone and we do not promote piracy. We suggest that you learn how to use a VPN to avoid breaking the law and hide from people prying on your private network. In addition, you can check out our best VPNs for torrenting to keep your torrenting activities protected and secure. It’s pretty sad to subscribe to a streaming service only to find out that Game of Thrones is not available in your region. We know that feeling. Fortunately, VPNs are here to do all the work for you. Don’t know how a VPN works? A VPN is a piece of software that is used to virtually hide your private internet connection to make your browsing experience safe and secure. It routes your internet traffic to a different country’s server so you can access content unavailable in your region. With a VPN enabled, you can subscribe to any streaming service available and watch Game of Thrones anytime, anywhere. But not all VPNs unlock geo-restricted content. Most don’t do the work. Scroll down below to check out two of our highly recommended VPNs that always get the job done. Whether you’re starting out or you’re just an occasional user of a VPN, you will always come across ExpressVPN. It’s our most top-rated VPN after all. With over 2000+ servers in 90 countries worldwide, bypassing geo-restrictions will be the least of your problems. This means that you can watch Game of Thrones basically anywhere around the world. For $8.32/month for a 1-year subscription, think of all you’ll be getting – high internet speeds, 24/7 customer service (for beginners), guaranteed bypass on geo-restrictions, and even torrenting! It’s a lot of value for money when compared to buying episodes on Amazon or iTunes, which can quickly add up. If you can’t afford the $8.32 price tag, then our second top-rated VPN, NordVPN is your bet. It’s cost-effective, as you get the same services for just $2.99/month on a 3-year plan. It’s the best alternative there is for a premium VPN. If you’re looking for a long-term streaming solution for geo-blocked content, it really doesn’t get any better than this rate. And don’t worry, NordVPN also supports torrenting so that’s a major plus! Did you find our guide to be useful? If you did, then start streaming right now at the comfort of your home! The series finale is set to air in mid-April this year, so you still have a lot of time to watch all 67 episodes to refresh your memory or catch up to the craze. Always remember that you can use your VPN to unblock geo-restrictions on Netflix or other streaming sites. Start watching now to know what’s happening in the Seven Kingdoms! + Works with Netflix 100%. + Responsive and helpful support. + Lots of servers work with Netflix. + A whole lot of servers. Torrenting reveals your IP to the public. A VPN hides your IP address while encrypting your activity. If you torrent or use unofficial streaming without a VPN, you will eventually get caught. Protect yourself and get a VPN for torrenting.